Andy Kim's victory will also mark the first time in over 20 years that a Korean American has been elected to Congress. Democrat Andy Kim has defeated Republican incumbent Tom MacArthur in a race to represent New Jersey's 3rd Congressional District, NBC News projected Wednesday. Kim had initially declared victory on the night of Nov. 7, but the race remained too close to call at the time. Kim won 49.9 percent of the vote as of Wednesday. MacArthur, an ally of President Donald Trump who voted to repeal and replace Obamacare, garnered 48.8 percent of the vote for the state’s 3rd Congressional District, which he has represented since 2015. MacArthur made headlines last year, following an unsuccessful attempt by Republicans to repeal and replace the Affordable Care Act, when he authored an amendment that breathed new life into the effort. The “MacArthur amendment” would have let states obtain waivers to allow insurers to charge some people more, including those with pre-existing conditions and those who are less healthy. MacArthur’s measure didn’t sit well with some voters in his district. Kim's victory will also mark the first time in over 20 years that a Korean American has been elected to Congress. The last one to serve was Jay Kim, a Republican who represented California in the House of Representatives from 1993 to 1999. One other race featuring a Korean American, Young Kim in California's 39th Congressional District, remains too close to call. Jay Kim made history himself as the first Korean American ever elected to Congress. But he left in 1999, losing a primary the year before amid a campaign contributions scandal. He ran again in 2000 for a House seat neighboring his old district, but lost that primary as well. Why hasn't there been a Korean American in Congress since 1999? While Korean Americans have found success over the past few decades in being elected to local and state office, winning a congressional seat has proved elusive — until now. 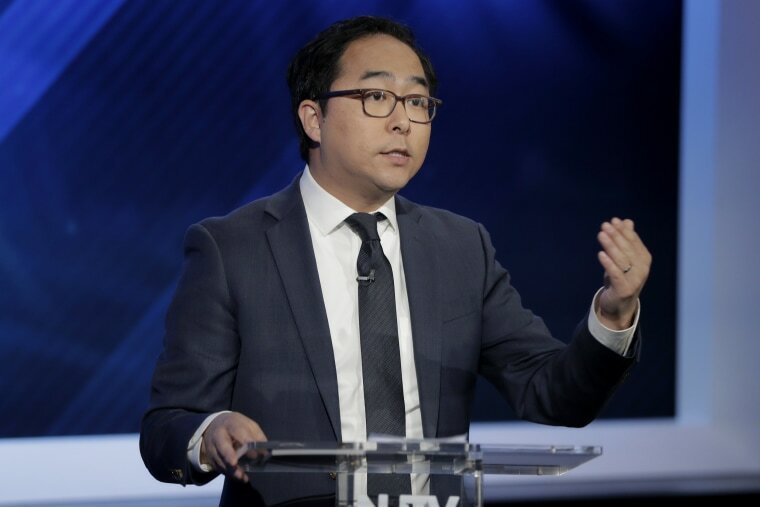 Running in the South Jersey district where he grew up, Democrat and congressman-elect Andy Kim, 36, launched his bid for the House following a career in public service. A Rhodes Scholar with a doctorate in international relations from the University of Oxford, Andy Kim worked in Afghanistan as an adviser to Gens. David Petraeus and John Allen. He also worked for the White House as the director of Iraq at the National Security Council. Andy Kim’s former boss, President Barack Obama, and the Asian Americans & Pacific Islanders Rising & Empowering Political Action Committee (ASPIRE PAC) both endorsed him. “He’s someone who obviously has a very qualified background,” ASPIRE PAC chair Rep. Grace Meng, D-N.Y., said in a phone interview this summer. “He’s impressive no matter how you slice it,” she added. The midterm elections, which saw Democrats regaining control of the House, saw historic wins with included a record number of women winning their races, according to NBC News. There were also major firsts, including the first Muslim women and the first Native American woman to be elected to Congress.